"Death, death, death, death, death." 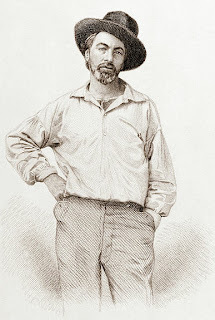 first edition (1855) of Leaves of Grass. So here’s my fifth and final series possibility, this one from 1859 again (that’s four out of five from 1859, but that’s okay…): 21 essays on the poem “Out of the Cradle Endlessly Rocking” by Walt Whitman. I grew up on Long Island. Much has changed, but not the ocean. It’s still a cradle endlessly rocking. And death is still an inescapable part of our world. This is the last of my official 1856-60 ideas (with no promises that I’ll necessarily be getting to any of them…).